The innovative design features throughout the nPod enables class leading reliability, flexibility and maximise cost savings for our customers. Fill level monitoring is most effective when the bin sensors are positioned optimally with consistently accurate readings being reported. The innovative nPod can be mounted into a variety of useful positions with ease. This ensures the bin sensor avoids rubbish flow, offer highest level performance and can be mounted to the most durable parts of the containers. The variable angle barrel housing dual ultrasonic sensing increases the accuracy and reliability of the fill level readings. The nPod’s multi-layer readings and cutting edge algorithms enable real time results to account for bin anomalies. Our flexible sensing solution enables reliable monitoring of a large range of materials and even water levels. 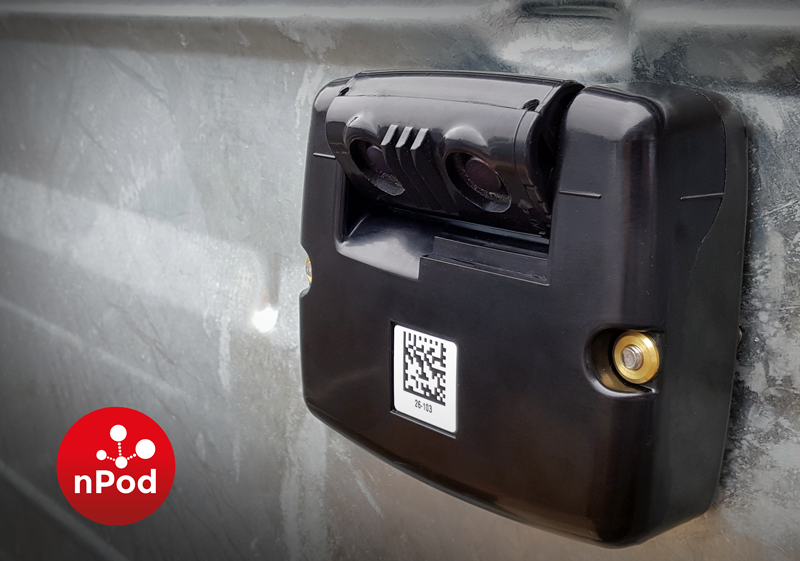 Our on-board accelerometer enables lift detection to pinpoint when containers have been collected or even if containers have been knocked over. 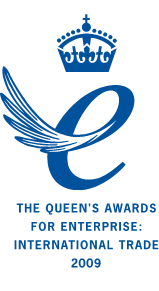 Our temperature sensing enables fire detection and identifies useful waste/weather trends for long term planning. Installation of the nPod is quick and easy using two tamper proof M6 stainless bolts, the sensor barrel is simply aimed at the optimum part of the container then securely locked. The highly impact resilient ABS Polycarbonate protects the advanced electronics inside which are compressed in foam combating severe vibration and impacts for reliable long term operation. 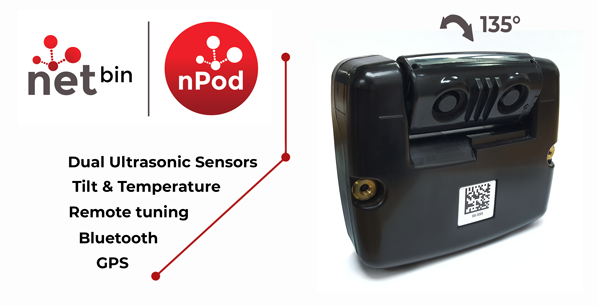 nPod uniquely takes advantage of low energy Bluetooth enabling; automated communications with netBin phone apps, connection of third party sensors and enables use of slave nPods (more soon). 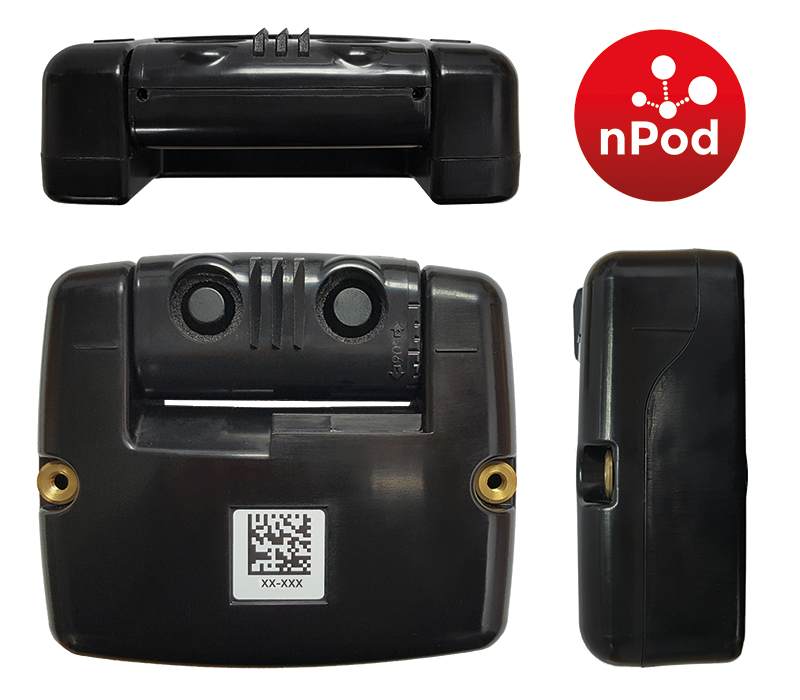 First developed in 2013 and launched to market the following year the netBin nPods have clocked up millions of hours of operation and have now deployed in over 24 countries worldwide. Ever since launch the bin sensor has been enhanced and improved by a dedicated in-house team. We strongly believe our nPods are the most reliable and accurate fill level sensors on the market. Get in touch to try for yourself.